Auto Detailing Training Videos – Secrets Now Revealed On 4 DVD’s! Detail King’s Auto Detailing Training Videos are the next best thing if you cannot attend our Hands-On Business Opportunity Training Seminar held in Pittsburgh, PA. The Detail King auto detailing school is one of the best in the nation. We provide hands on teaching from some of the most revered teachers in America. Obviously attending the auto detailing training seminar and working with the trainers, the staff, and the equipment is a wonderful experience but not everyone has the time to do that. 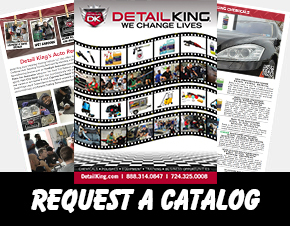 So Detail King® has professionally produced 4 AMAZING Auto Detailing Marketing and Hands-On Training Videos that total about 5 hours of viewing. Our car detailing training DVDs are an excellent resource if you want to break into the auto detailing business. This NEW Video Series contains information on How To Start, Operate, and Grow an Auto Detailing Business PLUS Step By Step Methods and Procedures of how to Professionally Detail a Vehicle. Our Auto Detailing Training Videos are the next best thing to participating in our auto detailing school in Pittsburgh, PA. If you have the desire to be your own boss or you just want to receive auto detailing training, these DVDs are just what you are looking for. Get car detailing training from professionals and learn trade secrets that you won’t be able to find anywhere else. Learn what you need to do to start your new auto detailing or mobile auto detailing business. Watch us professionally detail an entire car including the engine, the interior and the exterior. All four auto detailing training videos total about 5 hours of step-by-step instruction and explanation of how to professionally detail a vehicle along with what you need to know to start and grow your new detailing business. We also include our written Auto Detailing Methods and Procedures Guide and a FREE 22 page copy of the video narrative of How To Start, Operate & Grow an Auto Detailing Business. This series is also a great training aid for your sales and detailing staff and even a good review for the seasoned professional. Many “to be” owners of new auto detailing business start-ups have no clue of what they need to do to legally start their new venture. Our new two-hour video DVD “How to Start, Operate & Grow an Auto Detailing Business” will explain what the future entrepreneur needs to know to get started, operate and grow his or her car detailing business. We will discuss how to lay-out the ground work and what should be included in an auto detailing business plan. These auto detailing training videos will also explain about the permits and licenses needed to operate your new business legally along with how to choose a “catchy” name and promote it effectively. Nick Vacco, President and Founder of Detail King will reveal his trade secrets that he has used over the past 31 years of operating a very successful and profitable auto detailing business, mobile detailing business, aftermarket installation appearance center, express detail and lube center, limousine company, car wholesaling dealership, and for the last 16 years, Detailking.com! 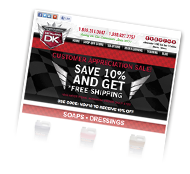 You will learn the most effective ways to promote your auto detailing business through advertising, promotion, prospecting, marketing, social media, direct email, SMS text alerts and direct face-to-face selling. He will also teach you the most successful methods to generate reoccurring revenue through repeat customers and referrals. Most new auto detailing business owners do not know how to price their jobs and usually don’t charge enough and eventually go out of business. In this video Nick will teach you how to determine what your hourly operating cost is, and how to determine your profit margins. You will also learn the type of insurances needed to operate your business, how to choose a credit card processor, and the pros and cons of operating a mobile or an affixed auto detailing business. Nick will show you how to obtain profitable commercial accounts, and how to advertise your business inexpensively with ways that you would of never even thought of. This video is an excellent tool for individuals that are already in business but may be struggling to keep ahead of the competition. Nick will teach you how to leave your competitors in the dust! We will include a 22 page DVD Narrative – A Text Follow-Along for this Training DVD Video. The washing, scrubbing and prepping of the vehicle prior to detailing it is just as important as the actual detail itself. If you do an inferior wash-up and prep, your detail will take you much longer and probably not turn out as well. In this video we show you how to properly clean, detail and dress an engine compartment and all the precautions you should take. Engine detailing is not hard to do and you can make up to $50 or more in just about 20 minutes of time. We teach and show you what to do so you can perform profitable engine cleaning services for your customers. Watch & learn how to clean and scrub all of the exterior components prior to giving the vehicle the final wash. We show you the correct steps and tools needed to scrub wheels, wheel wells, tires, bumpers, grills, convertible roofs and more. You will see the proper brushes and chemicals needed to get the vehicle prepared for the detail. You will also learn how to Clay the surfaces to remove environmental fall-out so the paint is perfectly smooth, clean and ready for the buffer and polisher. Bug and tar removal are also part of this process. You will see the proper way to remove both of those. We recommend watching this DVD first and reviewing the Methods and Procedures Guide for this portion of the training soon afterwards. Not just anyone can clean and detail an interior of a vehicle properly without learning exactly what to do and in the correct order. There are several components in the interior of a vehicle and it is critical that you know how and when to clean, detail and condition each particular component. Our Interior Cleaning & Detailing DVD will show you how to do it in the correct order and most profitable way. Time is money and auto detailing is very labor intense so it is vital for you to learn the proper methods and procedures from the very beginning. You will watch and learn the proper way to completely clean, scrub, detail and condition a vehicle interior. Our trainer will demonstrate how to vacuum, air purge, clean the headliner; leather seats, upholstery, carpets, vinyl components, console, dash board and all the nooks and crannies. This video will also teach you how to scrub and prep dirty carpets, the proper way to operate a heated interior extractor, how to use the Tornador interior cleaning tool and the best way to clean windows. Once you learn the proper way to clean and detail the interior of a vehicle, you will be better prepared to tackle exterior detailing because of all the many things you need to observe and detail in the interior of the vehicle. Knowing how to properly and professionally buff, polish and detail the exterior of a vehicle will save you time and help you and your detail team generate more revenues. You want your work to stand out and knock your customers’ socks off! A ho hum detail will never achieve that. The vehicle’s paint must Dazzle and Bling, the chrome should sparkle and all the trim and tires should look like new again. This video will show you what you need to do to make it all happen. You will see demonstrations of wet sanding, heavy compounding, light compounding, glazing, polishing, and sealant/wax application. You will also see the use of various buffng and polishing pads and how to determine the best product to use with them. We will show you how to use a rotary buffer and various orbital polishers. You will watch our trainer compound, glaze, wax, dress and detail the exterior of a black vehicle. This video also will show you the best method for dressing tires, vinyl and plastic trim. Jason McBride our senior certified trainer will teach you all of his techniques so you can learn how to make your customers vehicle’s Bling Bling, too! Separating yourself from your competition should be your goal for 2015. This video will help you do that. If you are just starting out in business or adding auto detailing to your existing automotive business our Auto Detailing Training DVD Box Set will be of great value to you. This is one affordable way Detail King® can provide our many years of auto detailing training and marketing expertise for you. The DVD’s are not returnable under any circumstances. We will replace any non operative DVD.